Hen night badges are the traditional accompaniments to the hen night. Whether the hen night is taking place in a bar, club, hotel or abroad then there needs to be the one thing that unites all the party goers. The most popular solution is to arrange for hen party badges. We have a great range of hen party badges that can be customised with the bride’s name, the venue of the party and the date. If required we can also add the name of each of the guests to the badges. This is an ideal addition and a great ice-breaker, if a lot of the people don’t know each other. You can choose from the range of designs and then personalise them, or design your own badge and send us the artwork or send us a photograph. We will use it to create a photo badge design with your choice of wording. The most popular size for our hen night rosettes in 57mm diameter. For most of the designs there is usually the option to have the badge in the larger size of 75mm diameter. 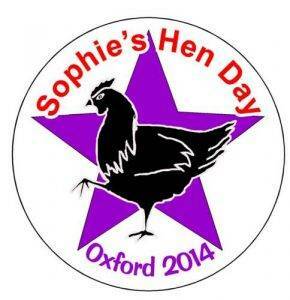 If you don’t want to have personalised badges then we also have a range of off the shelf standard hen night badges. These offer a cost effective alternative. Unfortuately we cannot personalise them or add the date or venue. But they can be a very economical and quick solution to a hen night party. For all of our badges then there is always the option available to convert them into a rosette – either a single rosette, double or triple layered rosette. The rosettes can be supplied in a range of ribbon colours with the centre of the rosette being a 57mm badge.